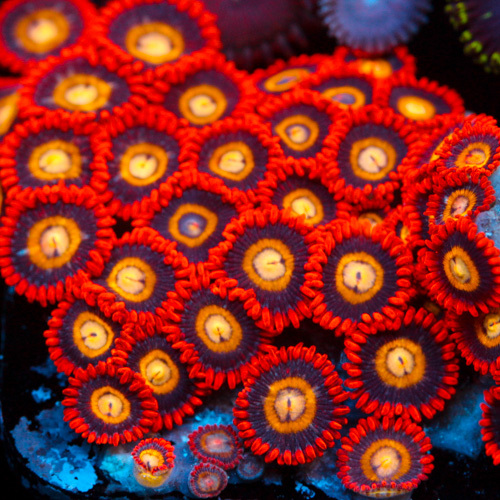 It’s been a while since we’ve had a featured coral of the week and with Reef-A-Palooza Orlando less than week away, we thought it would be nice to feature these Taiwan Zoas that will be available on sale at the Joe the Knows Reefs booth (#612). 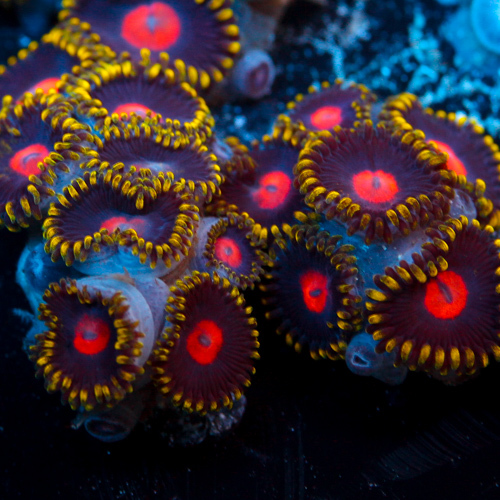 As you can see from the photo above (as well as the gallery below), Joey Nichols recently acquired some stunning zoanthid polyps from Taiwan. 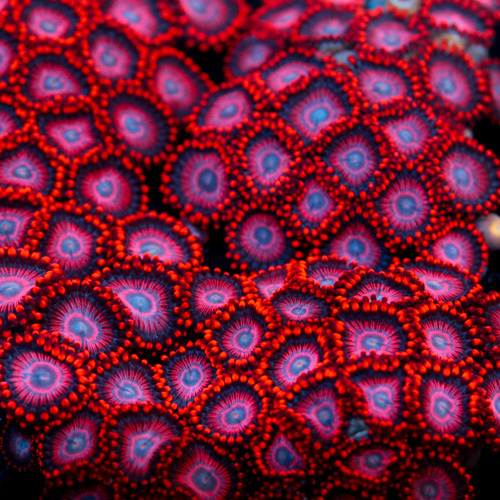 Considered to be some of the most stunning zoanthid polyps found anywhere, Taiwan zoas come in a variety of colors and color patterns. 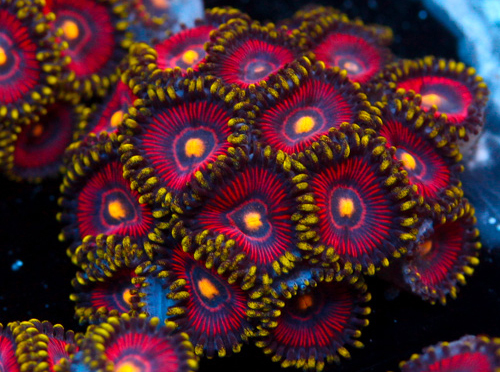 Featured this week is the Joe’s Solar Eclipse Zoa and they will be on sale at RAP where $75.00 will get you a 2-3 polyp frag. Zoanthid polyps have been a perennial favorite for both new and experienced aquarists. 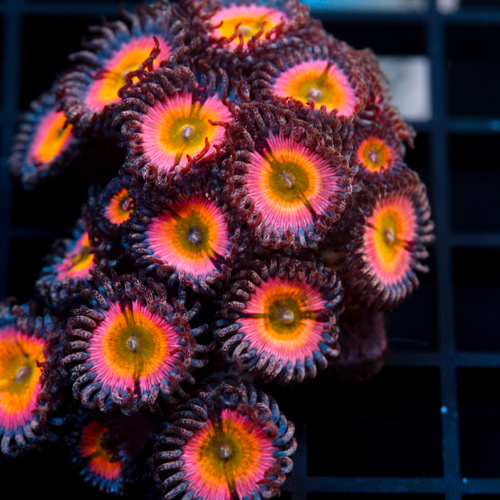 Zoanthids are easy to care for and range in price from very affordable to quite expensive. 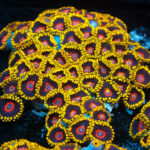 Some hobbyists and coral farmers only focus on these corals. 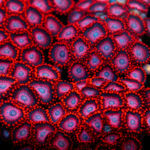 At trade shows like Reef-A-Palooza, you will be sure to see a huge selection of these corals. 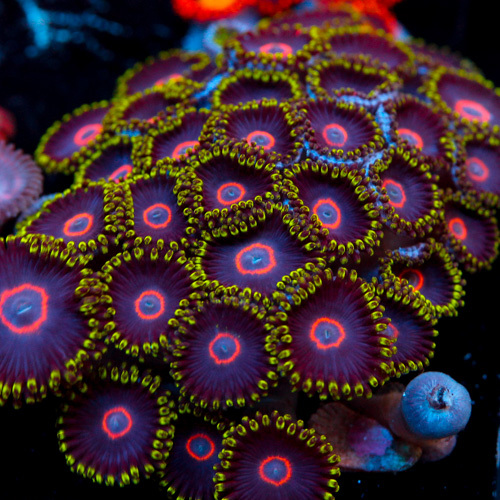 Zoanthids are relatively easy to care for and are much more tolerant of tanks which are struggling with nitrates and phosphates (dirtier water) so many people suggest that the growth rates are better in dirty water. 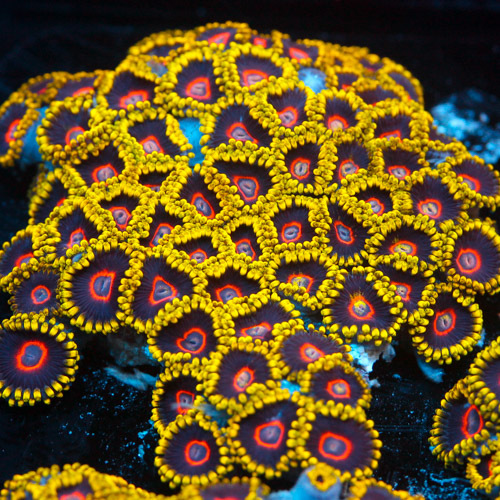 While Zoas will tolerate higher phosphate and nitrate levels, these conditions it’s not ideal as some suggest online. The idea behind this dirty water theory is that since these corallimorphs can survive in dirty water then they must like it or prefer it. However, my experience has been to keep PO4 and NO3 lower with some detectable NO3, proper filtration and bi-monthly water changes. 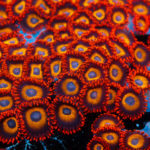 For faster growth and larger polyps, feed specific fine particulate coral foods and amino acids for the best results. Feeding these foods is easy by using turkey baster or Julian’s Thing however it is not necessary to target feed these corals for them to survive and spread on the rock work. When purchasing these corals, it is best to quarantine them for about a month before adding them to the main display. 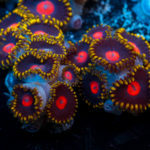 Pests and parasites such as zoanthid eating nudibranchs are often found within frags and colonies and they are difficult to spot if you don’t know what to look for. Also, you may not see any adults but eggs are even harder to spot and once they hatch then they can rapidly spread throughout the aquarium where they are difficult to eradicate. 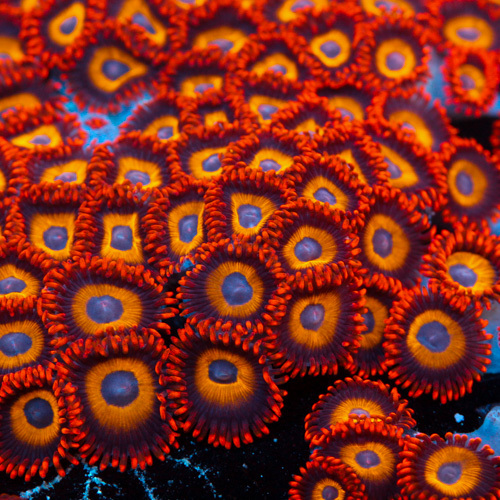 Erring on the side of caution is the best practice when introducing a new coral or other aquarium inhabitant. Below are some of the other Taiwan zoanthids that you can expect to find at the Joe Knows Reefs both this coming weekend.